Regular client Marc Freeman asked if I would set up a trip to Slovenia for him. He had a precise weekend available (wife heading off to a hen weekend at a music festival) and so I started looking around. I just happened, shortly after the request, to bump into Ryan Billic, a friend of Alan’s and he originated in Croatia, and suggested that if I wanted to try that country he could help me to set up the trip. He also knew “the best” guide in Croatia. So, I went with his advice, sorted out flights, accommodation and off we set. Everything went smoothly for the three of us (I should have said that Paul invited himself along on the trip) and we soon arrived in Brod na Kupi, the small village near to where we were staying. We shopped for a few provisions and then headed to our accommodation. This was where the first problem arose. Our village was so small that we passed though it in about the blink of an eye, but we couldn’t find house number 17. Three times round and also down a couple of side roads, and still no sign. Fortunately the owner of our house saw us and came out to greet us…in Croatian. Zdravko was pleasant enough and being the brother of the fishing guide, phoned Mladen and asked him to come and meet us. We were then shown to our rooms….only Zdravko seemed to think that we would like to share a room! Yes, all three in one small bedroom. It seems that is the custom in the country. It took a lot of persuading to make him let us have three separate rooms! Brother and fishing guide Mladen arrived and we talked fishing, compared flies, and had a couple of glasses of the compulsory sliivovica – the local “rocket fuel” that poses as an alcoholic drink! We then walked the short distance behind the houses to see the river. It was a pretty sight. The Kupa is quite large at this point even though it is only a few kilometres from the source. We saw a few fish rising and fancied popping back later to have a fish, unfortunately, our meal took a little longer to get sorted and so it was too dark when we were ready to fish. WE started on the tributary of the Kupa the next morning – the delightful Kupice. This river screamed fish to us. Malden took off downstream with Marc, whilst Paul and I set off upstream. Wading was tricky enough and Paul struggled so told me to carry on. I fished loads of lovely pools and likely spots without an offer and it was only on reaching the first sweeping bend that I spotted a pair of anglers about two hundred metres upstream….this explained why I had had no action, the fact that the pools had already been fished! I headed back to Paul and we crossed to the even smaller stream to the north – not sure if it was named. We gave this one about an hour but again saw nothing. I dropped back to the mill pool that forms at the junction. Here there were some impressive currents and likely looking areas for holding fish, and sure enough I spotted a huge grayling. It had a brief glance at the dry I had on, but no movement second or third casts. So I changed the fly for a small pheasant tail nymph with tungsten bead. Second cast was on the fish and it moved to intercept it and I lifted to feel resistance. 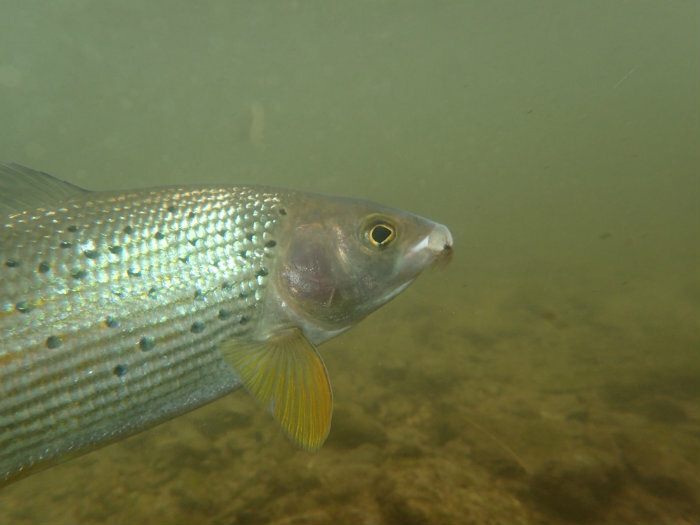 The large grayling headed into the current and in the clear water I could see that my “grayling” had changed into a very large chub! In the shadowy water I had presumed the fish to be a grayling! However I was not unhappy at landing a four-pound plus chub as my first fish in Croatia. Soon after this we met up with Marc and Mladen who had worked their way back to the cars having caught two very small grayling and seen little else. Mladen suggested a drive further upstream and so Paul and I followed. 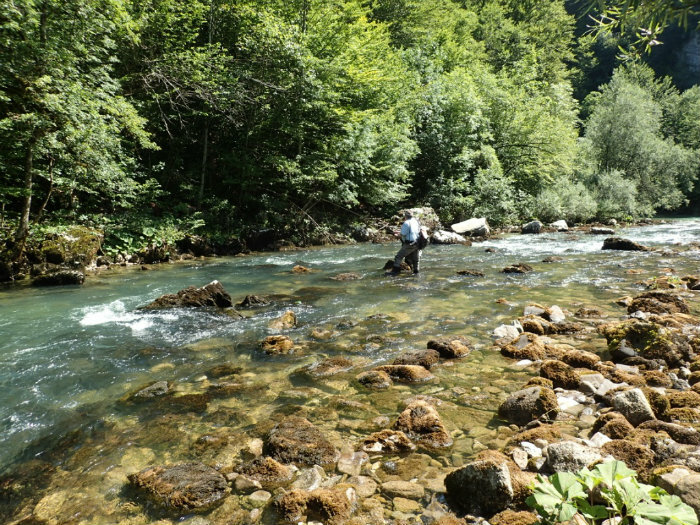 When we caught up with the pair, they told us that the spot even further upstream that Mladen wanted to fish was already being fished by up to six anglers. We hoped that this was not going to be the pattern for the few days there. Again Paul and I went up, whilst Marc and Mladen went down. This stretch was a stunning piece of water and soon I was into my first grayling – a fish of around a pound. I dropped back and let Paul have the pool and he soon caught a similar sized fish. Paul and I took turns hopping past each other and managed to catch a couple more smaller grayling, but now it was time to go to Ryan’s house for a barbecue. This was a splendid occasions at which we were treated royally. WE were served a variety of Croatian sausages, meats and potatoes accompanied by some fantastic salads, and great wines. After the early start, the travelling the day before, and the wine, combined with such warm (over thirty centigrade) weather a relaxing end to the day was called on, but instead we headed back to the river – this time near to Ryan’s house it was the Kupa. I went downstream and fished up some rapids, Mladen took Marc back to the morning’s venue to try for a Huchen, and Paul took a siesta! I caught a couple of small, beautifully marked brown trout, several grayling and had a great short session. Marc struggled as to fish for huchen a heavy outfit was used but they saw nothing anyway. Next day we started even earlier as we wanted to be back to our accommodation for breakfast and the third Lions test match from New Zealand. We managed a few grayling and small trout, and were ready for breakfast and rugby by nine o’clock. The game ended in a draw, we then became tourists and went to the coast. Driving to the coast we stopped a few times to take photographs and enjoy various views. We had a decent and reasonably priced meal right by the sea then went touring a few more harbours before heading back for a bit more fishing. In the evening we fished the main river at the confluence of the Kupice. Marc had a splendid time catching several grayling, a couple of trout and a few small chub, all on dry fly. Sunday was our “special” day fishing in the National Park. The fee here was a bit more than the usual cost, though still cheap in the scheme of things. I think a normal ticket on the rivers was around 23 euros, but it went up to 28 or 30 for the National Park. The river in the park was spectacular and we all caught some splendid grayling. 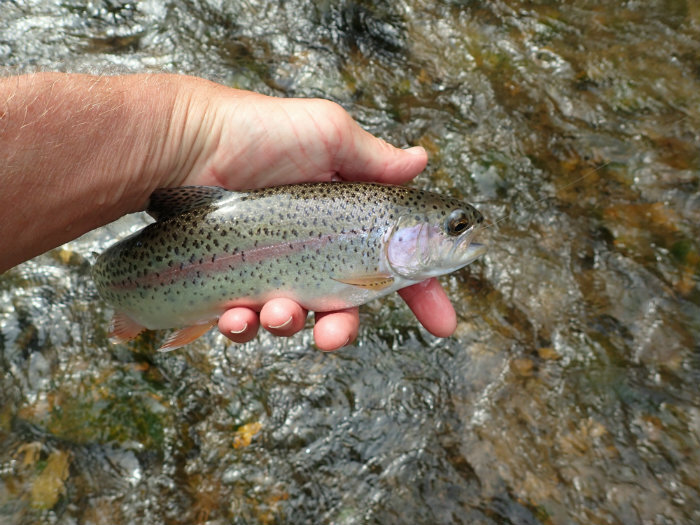 Most fish were caught on dry fly, but a few were taken on nymphs whenever the fish spotted wouldn’t come up on top. There were several pools that reminded me of fishing in the tropics for bonefish. Shallow, as clear as gin and big grayling sitting on station so that you could target one fish at a time. We had a long session of fishing before heading up to one of the local houses which doubles as a restaurant where we had a feast! The owner brought us a fabulous tomato salad, and then a huge plate of pork steaks and chips. All the time there was ice-cold beer available! 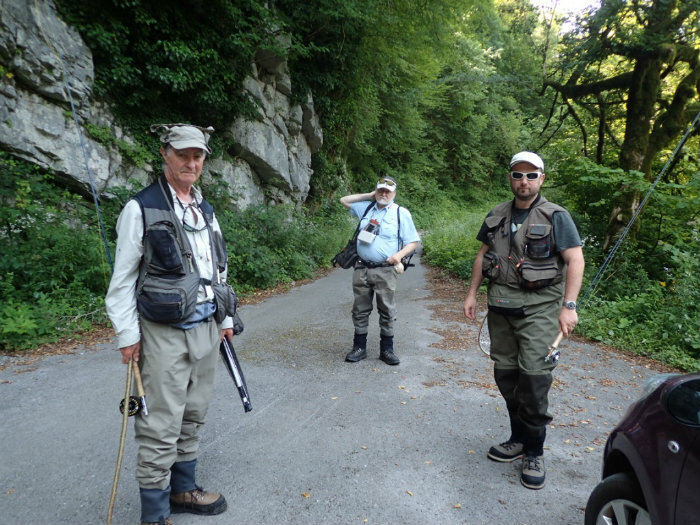 We were joined by a couple of Italian anglers who had just completed their second day of fishing and were going to eat and then drive back to Italy. 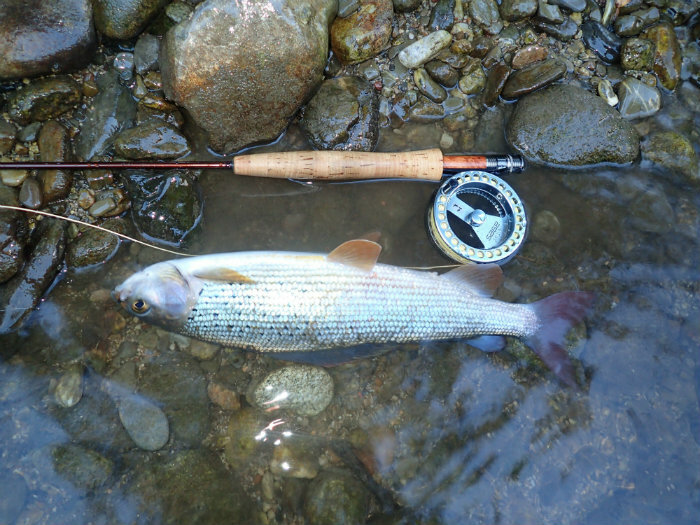 They told us that on the previous day they had caught about fifty grayling each – up to three pounds plus! Today had been poor and they had “only” caught about twenty each! Isn’t it strange how expectations differ between people. As a group I think we had maybe twenty between us at the lunch break (in truth it was about three o’clock in the afternoon) and we were absolutely delighted! 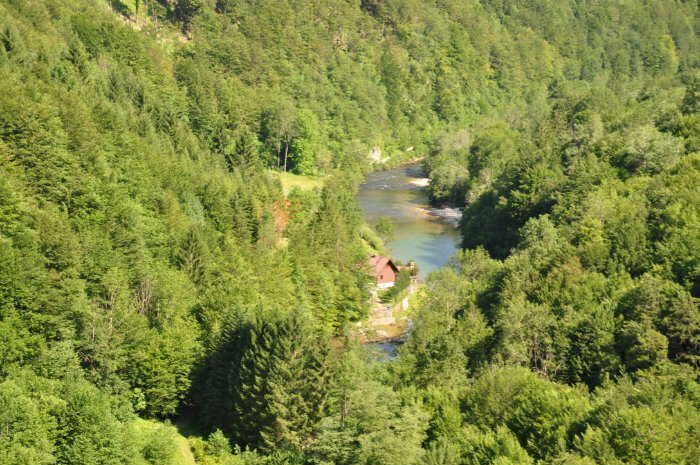 Our first view of the Kupa in the National Park – close to its source. We fished on until around eight and headed back. We maybe had another twenty in the afternoon, but probably didn’t! But, we all agreed that it was a fantastic place and we would be more than happy to return and give it another go. Next morning we fished a few hours as it was back to the airport. I went well downstream on the Kupa and fished a really fast run with a dry sedge of Mladen’s tying. I had about seven or eight fish from a ridiculously fast riffle, but then failed hopelessly on the long smooth flat water on my way back to meet the others. 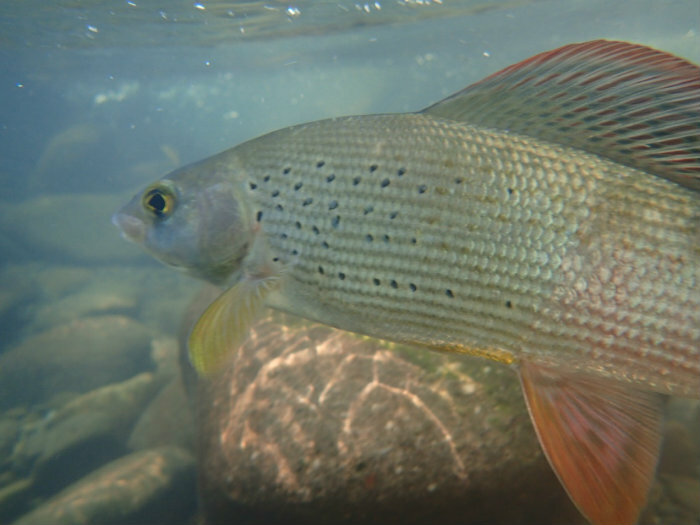 A few grayling were taken by all before we set off for showers and the drive back to Zagreb. Mladen guiding Marc in the National Park. I can highly recommend the area we stayed at and with the amount of fishing available it would be difficult to get to it all on a five day trip. We really only had three days fishing, but made the most of it. Most of our fish were taken on dries. My best was a size eighteen or twenty pardon de Meana. A simple imitation of an olive. The others stuck with the sedge that Mladen suggested. Small pheasant tail nymphs were also useful. We fished light leaders – I was on 0.12mm whilst Mark stuck with 0.14mm. 4-weight rods were used by Paul and Marc but I stuck to my one-weight. My proposed trip to Venezuela was cancelled virtually last minute by my heart surgeon friend who lives and works in the country. I believe that conditions in Venezuela have now deteriorated to the extent that it was possibly too dangerous for me to travel there. So, I booked a last-minus trip to Europe. A beginner on a recent class at Chew suggested that Slovakia would be a good place to visit as he has a property there. I considered this, but also consulted friends Ondrej (formerly from Czech Republic) and Paul Reddish, as both of these men have fished throughout Europe. Both advised Slovenia or Bosnia in preference to Slovakia, but flight costs were too high and so I booked my flight with Wizz Air, and a hire car with CarRentals.com and set off. I was impressed with Wizz air. They have a generous allowance for luggage (if you join their “club”), and the whole process with them was a pleasant experience. I arrived at Kosice Airport in the early hours of the morning and picked up my hire car. My first couple of nights were booked at an AirB&B in a small village called Liptoska Kokava. IT is very close to the river Bela, where I planned to fish the first couple of days. I met my guide for the first day – Andrej, and we went to buy my daily licence. He had already sorted out the state licence – I had provided him with my passport number and all the other information required. This bought we headed for the river Bela. Andrej explained the style of fishing we would be doing. Basically he likes to fish a strike indicator (he uses a piece of booby cord) and then two heavily leaded flies to get into the depths. The point one is his heavier fly (I know that in U.K. many anglers prefer the dropper to be the heavier), both being tungsten bead flies. A dark pheasant tail went on the point and a smaller hare’s ear went on the dropper.His whole set-up was rather a complex set of knots and loops and more knots – personally I prefer to keep things simple, but, as a guide myself, I know to just “go with the flow”. We parked my car (he left his back in the main town at the hotel) and then walked downstream for about thirty minutes. We fished our way back up the river. The Bela is a gorgeous clear river with one heck of a fall on it. There are trees fallen in it, big boulders, cliff faces, wild flowers down to the edge, and best of all, wild raspberries and strawberries to eat as you work your way along the bankside. At times the river can be crossed relatively easily, at others it is far too difficult to cross. The fishing was slow. With the flow as it was I was never confident that my flies were really getting deep enough, but regularly I had Andrej yell “strike”. I did so even when he didn’t tell me to and after about the one hundredth I actually asked him if he really believed that these were fish at all! HE thought that many were…..
On about the third pool that we fished I hooked my first brown trout. It fought hard in the fast current and although not huge took a bit of landing on my Helios four weight. I caught another four or five through the day, but have to say that just being there was enough for me as it was such a beautiful environment. Any fish on the end were a true bonus. There was no rise on the river, and even though we stayed relatively late nothing seemed to happen after about five thirty. We could have fished until eight thirty, but I was happy to end at a decent time as Andrej had a two-hour drive home through the mountains. I woke next morning to heavy rain and suspected that the river might be in flood (I had been aware of the rain a couple of times in the night), but on crossing the Bela on the way to the hotel that sells the licence, I found that it was as clear as the day before. 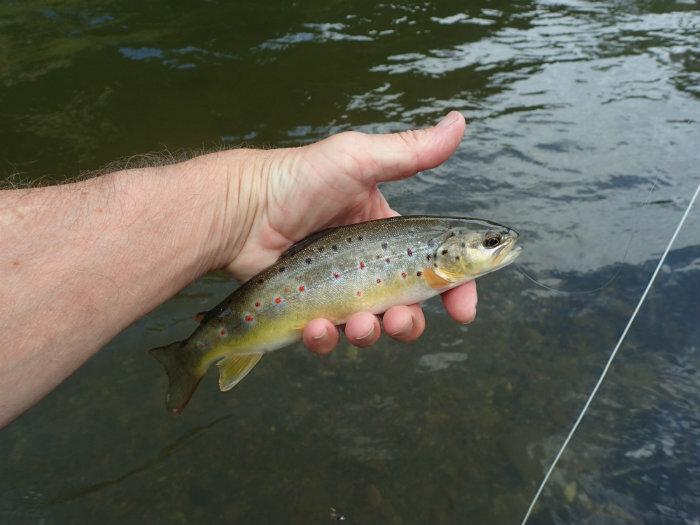 I opted to fish the larger river – the Vah on this second day and paid my fees. I drove to the spot that I was to park and only then discovered that the Vah was indeed really badly coloured and high after the rain. I returned to the hotel and the lovely receptionist was able to change my licence to the Bela. I fished further downstream than the previous day. The river if anything looked even better down here. So, I lost myself for the next five hours! I had a wonderful time fishing pools, glides and falls, and all sorts of venues. I caught several grayling on this lower bit of river, and had some decent browns. But, I never felt that I had the river worked out. IT really is as fast a river as any that I fished even in New Zealand. I don’t like the strike indicator idea of Andrej, and I felt that a four-weight was probably just a bit too heavy. 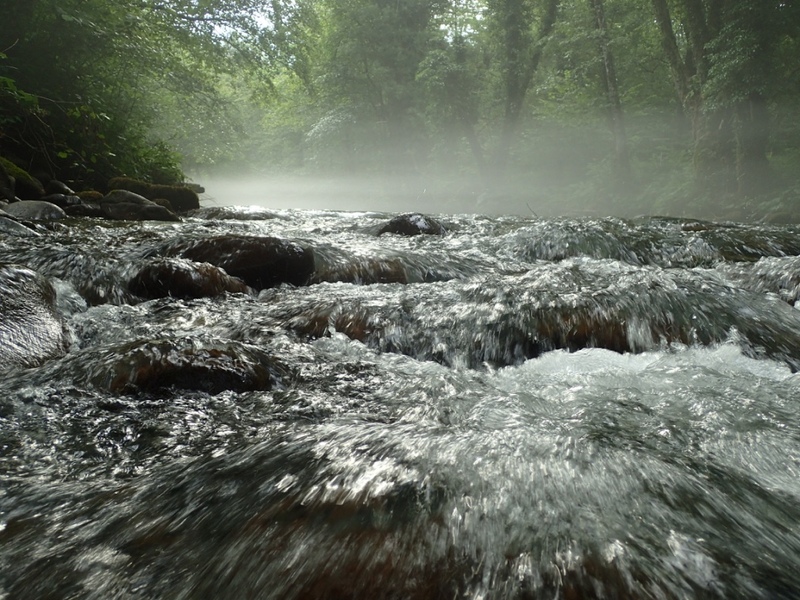 I returned to the car and decided to fish near to my accommodation – the river braids there and is rather appealing to look at. I found one really deep pool with a couple of very large grayling but I did not have a bug heavy enough to get down to them. I fished up the river until sunset, adding not many more (as the day before, things seemed to go quiet after five thirty, in spite of the fading light). Day three and the Vah was fishable so I went up to my appointed spot. I found a lovely pool just off a sharp bend and I thought that there had to be a good head of fish here. I caught one fair sized brown trout, but thought I should have had more. The river shallowed round the corner, but became so rapid that it was impossible to walk any further. I went upstream on the bank and tried further up the river. There were no decent pools so I decided that I would try the first pool again, but with a longer leader. This really did work well and first run down I had a good brown, then a small rainbow and then a small grayling. I caught couple more fish before deciding that I would look near the town. The river here was a bit less attractive as it backs onto factories and tower blocks, yet the pools were just as good. I fished the evening and managed a couple on dries, in fact I opted to stick with dries as odd fish were showing, and in the fast riffles grayling especially would just come up and take the fly. The smaller fish proved really difficult to hook, but I managed a few. I returned to my hotel – I booked a room in the place where licences are bought. I went to the restaurant for a well earned beer and meal, only to find that everything closes at nine. I’d fished until eight thirty and by the time I’d checked-in, taken bags up, washed and gone down to the bar, I was only in time to take one beer! To be honest I was happy enough with a relatively early night. Next day I set off to Rozemborok – a big town further downstream on the river Vah. 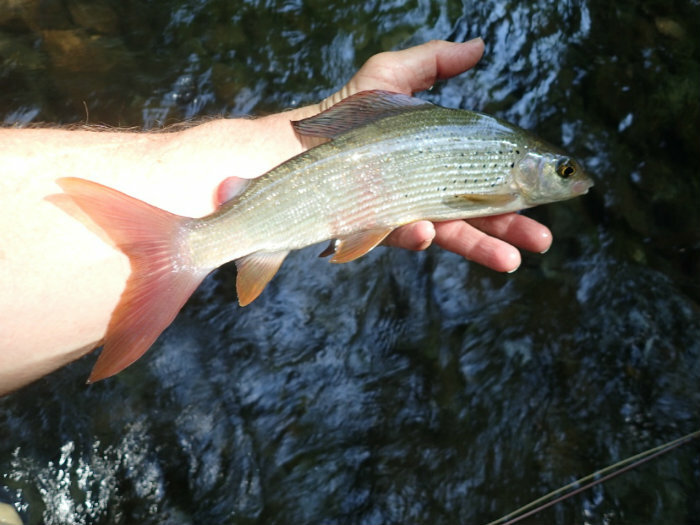 I had read that the river being larger here had a bigger population of grayling, and if that wasn’t too good, then the smaller river Revuca would be worth a day. I found the lovely tackle shop called “Thymallus” and chatted with the guys there about my fishing the next three days. IT turned out that there was a big competition on the main river on Saturday and Sunday and the bank holiday Monday! So, I would not be allowed to fish it. So, I had no choice but to fish the REvuca. I was also advised (and had read) that the ski hotel called Hotel Bodegas would be the best area to stay and fish. This was superb information and I had a brilliant two nights there. The river is a delight. I fished it with my one-weight and dries (I did give the nymphs a short go but although I caught a couple, I decided that working the river with dries to be the best option) and over the two days covered a huge amount of river and caught plenty of browns, a couple of rainbows, one brook trout and many grayling. In the fast water a small paltered fly was easily the best option. The local fly was one that had about two thirds grizzle hackle (rear part) and front part furnace hackle. The flatter sections I used my friend’s Paradun – Luis Meana’s pattern is a gem! I had some really good grayling on the second day in a long flat pool. These fish took a lot to coax up. The best pattern was a size 20 pardon. Luis’ flies are all tied with Coq de Leon feathers, and have rather complex tying, but I think it is well worth it. On the second day I fished until dark and came upon a fantastic area that came alive with rising trout for the final twenty minutes. I caught plenty of these feisty browns and when the fly stopped working I realised that it had completely disintegrated! That was then time to pack up and trudge back to my hotel….again too late for any food! But, the compensation is that breakfasts are really fantastic. I drove back along the main motorway to fish at a small village called Svit. 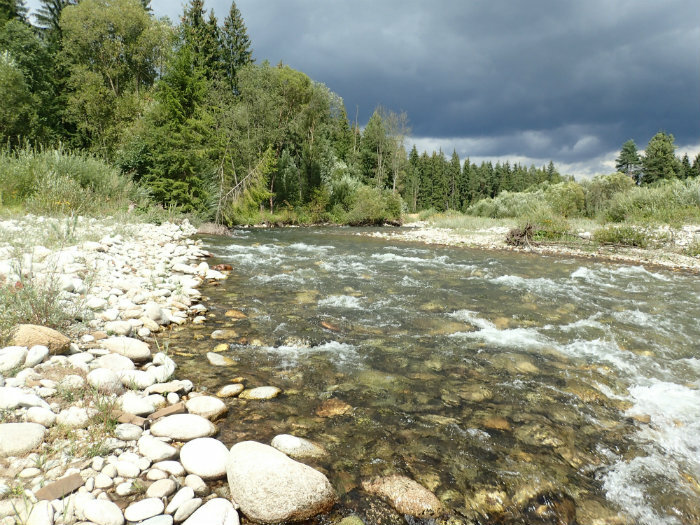 This is on the river Poprad. I spent ages trying to find somewhere that might sell a licence. Everyone warns you that fishing without one is liable to end you up in prison, though I wondered if that might be a modern myth. I didn’t have my licence checked once in six full days fishing! I drove to Poprad to the fishing shop that opens seven days a week, only to find it was shut. The guy who runs it was probably fishing the competition down on the Vah! In desperation I went to the main town and tried in the largest hotel. Again the receptionist was wonderful and found through several phone calls that a small Pension in Svit would be able to sell me a licence. So, back to Svit and sure enough I bought my licence. I was soon tackled up and in the river. The small river is a series of small weirs. I fished the entire length of one of these areas without so much as seeing a fish. As the approaching thunderstorm threatened I cast into the white water of the weir and immediately hooked a decent brown trout. It slipped the hook, and nothing else came to the fly. I hurried back to the car as the rain worsened and the flashes of lightning became more regular. I was stuck there for almost two hours, but eventually I was able to get into the river again. I went up to the stretch above where I had finished. As I stepped into the water I spotted a fish rising and about third or fourth cast hooked it. IT was my largest brown trout of the whole trip and fought well. However, as I played it I could see the river visibly rising and so by the time I brought it to hand, I had to get out and call it a day. That was the end of my fishing in Slovakia. I drove to the airport the next day across the mountains rather than along the motorway. IT is a really beautiful country. 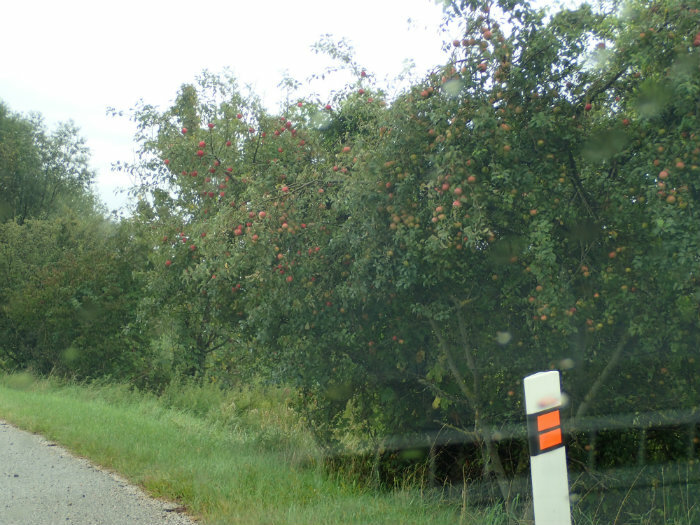 As I said in the title, it seems like all of the roads are lined with apple trees. 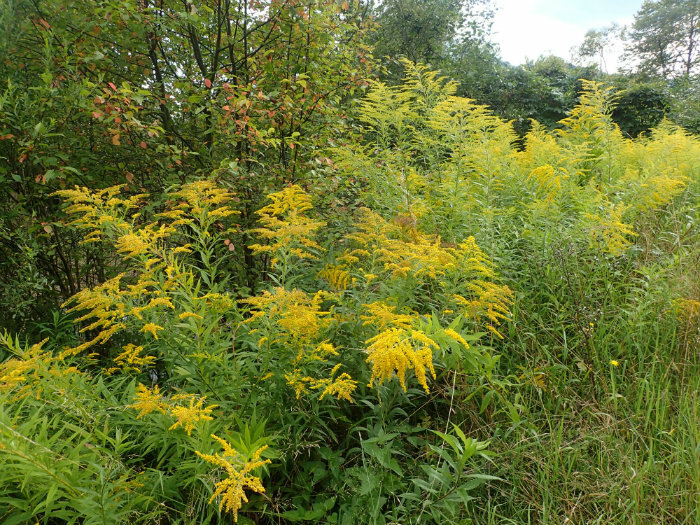 And Golden rod can be found along the hedgerows and riverbanks in profusion. I will surely return here of the ease of travel, the lovely people and the beautiful rivers will call me back. However, I ought to check out Bosnia and Slovenia too! I took a bunch of friends to Ireland in early May and we really had a tough time of the weather. With boats hired for six days, we ended up not using them for two of those days as Corrib was more like the North Sea. The days we went out fishing as tough. We had chances and caught on buzzers fished slowly or static, but personally I don’t go to Ireland to fish such methods. I was hoping for some dry fly sport. There were some mayflies about and there were heaps of olives, but as I have often found, the fish were really not responding to the adult olives. We had a marvellous cottage right on the lough shore and we had barely thirty metres to walk to get on board each day. I hired a couple of the boats from Basil Shields and the third one from Paul Miller. 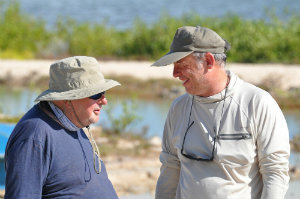 Both were very helpful about location of trout and what was likely to work….buzzers fished slowly. I was most interested with Basil’s suggestion that the best time on Corrib for dry fly fishing is probably August or September. I will maybe take advantage of that later in the year! Back from Corrib I was on Chew or Blagdon most days in May and so far most days in June. May was remarkable, mostly for how cold the wind was. Day after day I was out wearing five layers minimum, and quite often six. The wind was almost always from the west – not normally noted for such cold winds! Even now in June there are usually cold winds to end most days, and it is a brave man who goes out on a boat without a few layers as back-up. I waited in vain for much surface activity in May. I had odd evenings when the last hour would produce half a dozen chances as a few hardy trout rose – especially in the sheltered spots around the lakes. But, on the whole there was little surface feeding and only very rarely during daylight hours. 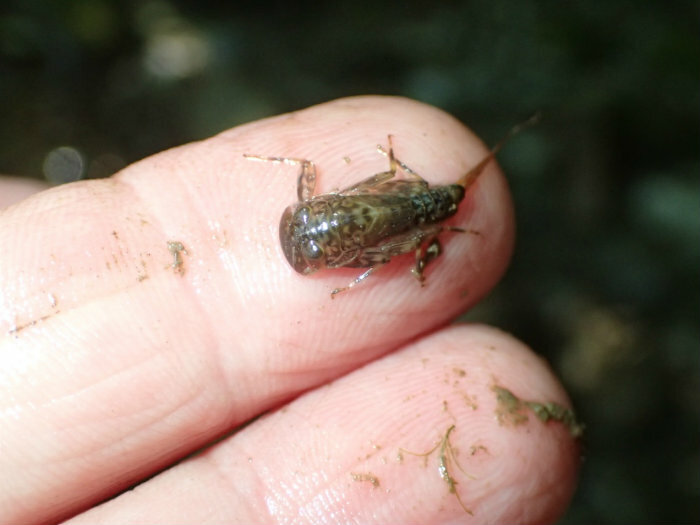 Things changed a couple of weeks ago and on the last ten trips I have not even had to consider using a nymph! It has been excellent fishing on Chew as many days produced fine dry fly sport. One of the best days so far was the one that coincided with the BRFFA Orvis Classic Competition. I happened to be taking the Orvis supremo Richard Banbury that day and from almost the start we had fish to cover. Richard performed admirably by capturing eight fish – with one going 5lbs 7oz. His total for the eight fish was over 27lbs. Every fish that we caught that day was covered, yet remarkably when we chatted to anglers later in the day, many had not seen any fish to cover. The Barrow Tanks are a favourite “escape” for me for when I have no clients and so I started having a look up there about a month ago. Sadly the cold wind had exactly the same effect on the fish here as on the larger lakes and on the first two trips I barely saw a fish. Even last week there were relatively few fish moving, though a few coming blind. I introduced client Marc Freeman to number two tank a couple of weeks ago and on a poor night he managed to land two decent fish for the tanks – both over two pounds. Marc thought that there was a decent rise, though as he has not seen the place on form he wouldn’t know what it can be like. I have managed another couple of “escape” trips to the river Usk. These have been fun and each time the river has shown just how healthy it is as there have been great fly hatches and decent amounts of trout rising. Just last week I was near Crickhowell and I had a great time with several fish returned up to about two pounds. I don’t take fish from the river as they are wild fish and don’t need me to be denting the stocks! I have a trip to Ireland next week for the caenis feeders so I am hoping for some settled weather. I am not sure what the chances of that are! On the 23rd March I took the plunge and set off to Extemadura with regular client John Wingrove. John is on a great amount of medication for various problems and so this was a trip undertaken with reservation. However, I had employed the assistance of my friend and local guide, Luis Meana, the master fly tier who specialises in the “paradon de Meana”. Luis is obsessed with the fly from the coq de Leon and has virtually devoted his life to making his flies more widely known. Last November he had to cancel joining me on a fishing trip because he was invited to present a talk and demonstration on his flies in New York, and next weekend he heads off to do something similar in Denmark. I can recommend his book all about the subject – “The Paradon de Meana and the Feather of Gallo de Leon”. You can check out his website www.cotossalmoneros.com” for a lot more information. We met Luis at Madrid and were soon speeding down the motorway to La Siberia. This is a part of Spain rarely visited by tourists. It is, as its name suggest, remote, and wild. However it is truly beautiful. And the system of reservoirs is just stunning. It really is a fisherman’s dream to visit such a place. Many barbel fishermen know all about Orellana and I have previously fished Cijara. In Cijara there are some great pike, a lot of black bass and a somewhat puzzling amount of barbel. I was first put onto fishing Cijara by Andy Lush (you may know him as the owner of “The Friendly Fisherman” fishing store). He had discovered barbel fishing there many years ago and these barbel were avid feeders on surface flies! That to me sounded too good to be true so it was not long before I was booking a trip and heading out there. Well, on arrival we found few barbel – apparently all spawning, though I have my doubts on that, but many black bass which were really keen on taking fly, and so we had a great holiday fishing for this strange fish. I have returned several times to fish for barbel with dry fly and always managed to find some feeders. As Andy suggested to me way back, these barbel just love a surface fly! It seems so odd. You can watch the fish cruising and occasionally grubbing around on the bottom, but put an ant pattern, or a beetle over them and you have a good chance of them taking this imitation. For a couple of years this has puzzled me as I have never seen a barbel rise to a natural fly. But, on this trip with John I saw this happen regularly. IN fact on the one day when the temperature reached around thirty, there were many different insects around and obviously some of them fell on the surface of the lake. The barbel didn’t miss out on this opportunity. 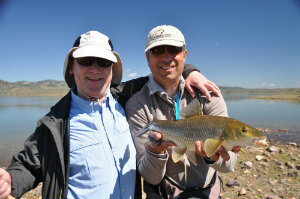 John and I had good sport with the fish – and, all were caught on dry flies. The most important aspect to this fishing is getting the conditions right – though isn’t that the case with most fishing? The BEST fishing conditions in Extremadura are bright sunshine and calm! These conditions give you the most amazing spotting conditions. The lakes are clear anyway, but with the sunshine that we had on the final two days, it was often possible to make out a fish moving along the bottom at over fifty metres. The shallow margins are the first parts to warm up and so the fish take advantage of this as soon as the sun gives off some heat. John had two great days of fishing and managed to catch nine fish. Several of them took him well into his backing. His best fish would have been around five pounds. We both fished with five weight rods, tapered leader and tippet around 10 pounds. The flies are fairly big (beetles on a size 10 or 8 and the ants and grasshoppers are on a longer shanked hook about a ten) and so there is no point on fishing any lighter. The fish don’t seem too worried by the thick tippet. There are few obstructions in the lake, but often there are plenty behind you. I can highly recommend a trip out there. Personally I cannot wait to get back. Finally I must say that those of you who are interested in the wildlife aspect of your sport, then this is a MUST trip to do. 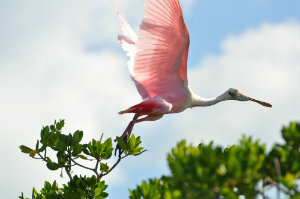 The birdlife is amazing. I saw many species that I have never encountered before – including a pratincole, a crag martin, serin, and Imperial Eagle. I heard cuckoos each day, saw hoopoes and azure winged magpies, and spectacular butterflies including swallow tails. And storks can be seen nesting on all sorts of odd places, including a huge crane! I couldn’t get my usual spot in Cuba this year so I booked in for a month earlier. The group met up at Gatwick after check-in and once we had ensured that a decent supply of “whicky” (as the Cubans call it) was bought, we settled for a chat over a departure refreshment. This year there were seven of us. Crooky as usual, Simon Hodges and Andrew Barker who both came last year, and new to our party, Matthew, John and James. The flight seemed longer than usual, maybe we were all so looking forward to this particular trip! But, on reaching Havana we were through the immigration ever so quickly as I had made the decision to book at no great expense the v.i.p. “meet and greet” service. I wholeheartedly recommend this service as later in the trip I spoke with a couple of people who were on our flight and they took over two and half hours to clear immigration. We were in the lounge awaiting our bags within half an hour, and we were able to get a cool beer in the air conditioned lounge! Money changed and bags loaded off we went to Caleton. The driver was as slow as any I have encountered in Cuba, but I guess he was at least pretty safe. A quick snack greeted us at our Casa and then we hit our beds. The guides were waiting for us next morning as we headed down the long track to La Salinas. As per the night before Camillo – our driver, was very cautious and this meant that the journey to fishing each day would be over an hour. However the coach was fairly comfortable and we could chat and sort out gear and leaders if we wanted to and one or two of the group would usually catch up on sleep. First day on the flats was wonderful. It was so good to be back there again. Everyone caught fish that day, though the newcomers experienced much frustration as they attempted to cast at the “ghosts” that the guides were repeatedly pointing out! By the end of the week all of the guys were spotting some fish and catch rates improved. James had a superb jack crevalle of about twenty pounds on day three . 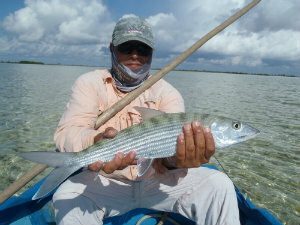 This fish was caught on his eight-weight bonefish outfit and took him at least an hour to land. John caught the largest bonefish which measured 57 cm, and so would have been around 6.5lbs – great achievement on his first trip. 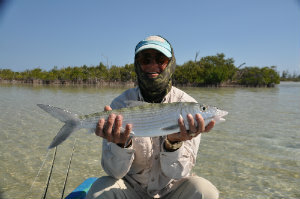 Simon had the most bonefish for the week, whilst on one day alone, Andrew managed to catch 24 bonefish! 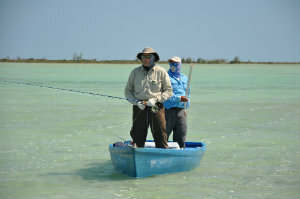 Strangely, that day I managed not one bonefish, though I did catch my first shark on a fly. 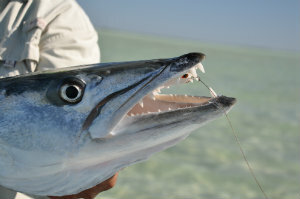 There were several decent barracuda caught by the party, one or two decent snapper and many odds and ends. Tarpon were few and so we opted out of trips to the river. Crooky managed one tarpon as did James. My day on the river resulted in quite an amazing hook-up! I had stopped for lunch with my guide Jasil next to an old hulk half sunken. I had hoped that there would be a few snapper around and had changed from my 400-grain line with a black death fly, to a floater and clouser minnow. There were no snapper around so we relaxed and had our rolls. Then I spotted a fairly decent snapper appear from under the stern of the boat. I dropped the closer towards the fish and it took instantly. At that moment a juvenile pelican flew into the bay and immediately seized my fish! I was now playing a pelican instead of a snapper. Eventually I wrestled the snapper out of the bird’s pouch and managed to swing it in before the pelican was able to grab it again. The fish lost a few scales but seemed untroubled by the attention that the pelican had given it! We experienced some unseasonably cool weather this year and several mornings and evenings had to don a sweater or fleece as all of our meals were served outdoors as is the norm. We even had to wear an extra layer on a couple of mornings on the flats. However, by one or two every day temperatures were hitting 26 plus, and we often went over 30 degrees. The flats took longer to warm up than any trip I have done so far, and so it was no great worry to pole out for a long time (and distance) as there were often few fish in until the water warmed. I saw permit on day one and day two. The first day the fish were already disturbed and chasing about in an odd fashion. On casting in front of one of the fish it headed straight towards my fly but turned around and set off for the horizon at an amazing speed. The two fish I saw on day two were feeding and oblivious to my guide and me. I managed a decent cast and one of the fish swam over to my fly but didn’t pick it up. However it was not disturbed so I had another shot. This time the fly was ignored, so I went a third time. Again one of the fish came to the fly, but again it failed to take. Another couple of casts did nothing and then the fish just moved steadily away. I’ll get one yet! I tried to book the place for next year as we all get on so well with the guides and the lovely people who run our casa, but no bookings are being taken. IT seems that as the market is opening to the Americans, the fishing lodges and operations are beginning to realise their potential and so are making plans to capitalise on things. So, I have made arrangements to return in late October through to early November as the operation I use will still be available then. Anyone interested in that trip please let me know as soon as possible. I will be emailing my regular clients with details.